The recently formed Orthodox Church of Ukraine has been granted independence, marking a historic split from the Russian Church. 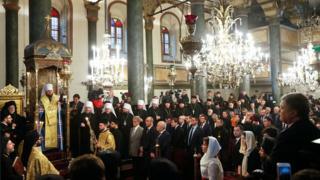 The Ecumenical Patriarch in Istanbul, Turkey – the head of the global Orthodox Church – has signed a document giving “autocephaly” or independence. It formalises an October announcement. The move has provoked a furious response in Russia, where the Church has broken off links, deepening a split in the worldwide Orthodox Church. Ukraine’s churches have for centuries been under the authority of the leaders of the Russian Orthodox Church in Moscow. The decision may also lead to a lasting schism in the global Orthodox movement, says the BBC’s Jonah Fisher in Kiev, Ukraine. What are the events in Istanbul? The Patriarch has signed what is known as a “tomos”, a decree officially recognising an independent Ukrainian Orthodox Church, in the presence of Ukrainian President Petro Poroshenko, who travelled to Istanbul for the occasion. Istanbul remained the centre of the Orthodox Church after the Muslim Ottoman Turks occupied the city, then known as Constantinople, in the 15th Century. The event at St George’s cathedral is being broadcast live on Ukrainian television. The tomos will be handed over on Sunday, and brought back to Ukraine on what is the Orthodox Christmas Eve. On Monday – Christmas Day – a celebration and rally will take place in central Kiev. Upset at losing its Ukrainian parishes, the Russian Orthodox Church – which is the world’s largest – has already cut ties with the Ecumenical Patriarchate of Constantinople, the spiritual authority of the world’s Orthodox church after it recognised the Ukrainian Church’s independence. Now, priests from the Kiev Patriarchate and the Autocephalous Church become members of the new Church – the Orthodox Church of Ukraine. The Moscow branch of the Ukrainian Church has denied accusations that it acts as a tool of the Kremlin, and says it has tried to bring about peace in eastern Ukraine. Earlier this year, the Ecumenical Patriarchate of Constantinople overruled its decision dating back to 1686 to transfer its jurisdiction over Kievan Orthodox churches (known as the Kievan Metropolis) to Moscow.